Along with swimming smooth, swimming with sustainability, or swimming endurance, is the most important skill for a triathlete to have. It does a triathlete no good to get out in front of the pack, swim strong to the first buoy, then completely come apart and struggle the rest of the way. The ability to sustain a high intensity is paramount, behind only smooth in importance. Having a pretty stroke for half the race and then watching your arms come off and float to the bottom of the ocean isn't terribly useful. As stated, a major part of sustainable work will be focused on maintaining smooth swimming. 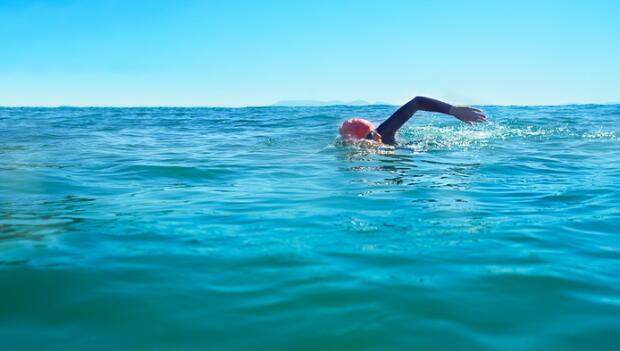 The other focus of sustainable swimming is being fit enough to allow you to get out of the water after 1.5K and blast up the beach, through T1 and out onto your bike. These will be longer sets, much like your long, slow-distance runs and rides. Maintaining a steady pace and heart rate is the goal, not cranking it to 11. Be sure to warm up before you go into your main sets with 200 to 500 yards nice and easy. This should shake the cobwebs out and get the blood into your muscles. You can also use active rest, 50 to 100 yards easy. Please note that under set #2 there are many ideas for drill variation. Be creative with this. These are guidelines and ideas. They can be used on almost any of these sets. Many of the other sets also have variation possibilities. Much like the 10 x 100 strong set, this is an excellent benchmark set for swimming endurance. While swimming these 500s, you should monitor stroke deterioration, prevent yourself from dropping your hips, drive the stroke from your hips, prevent your elbows from falling below your hands, and avoid cutting your finish short. Your goal should be to finish each 500 at about the same time. You don't want to fade, you want to pace properly. This set is nearly 1.5K, and so it's a good test set. These 200s make a great bread-and-butter set for 1.5K preparation. They are long enough that you build endurance, but not so long as to be intimidating. You can't crank a 200 like it's a 100, but you don't need to worry about swimming too hard and getting exhausted like a 500. A) Mixing the 1, 2, 3, swim drill into the 200 set is an excellent way to get both distance and technique worked at the same time. I suggest doing the first 100 as the 1, 2, 3, Swim and the second 100 normal, while focusing on the grab. Breathing drills are very helpful for sustainability. A good breathing drill is 5, 7, 9 drill. This is done by counting strokes and breathing on the fifth, then seventh, then ninth, then back to fifth stroke. It will hurt, but it will force you to smooth out your stroke and make it more efficient. Efficient strokes use less oxygen. Breathing on odd numbered strokes also means that you will be bilaterally breathing, or breathing to both sides. Bilateral breathing is important because you don't want to be breathing directly into a wave or another swimmer. Beginners should modify the 5, 7, 9 drill to 3, 5, 7. The goal is success, not failure. You will not get better through failure in these drills. You need to practice correctly. If getting all the way to seven is too hard at the beginning only do a 3, 5 repeat. Do not ego swim. B) Incorporate the 5, 7, 9 (3, 5, 7) drill into the 200s the same way you would incorporate the 1, 2, 3, Swim drill, as 100 drill/100 swim. c) Mix two drills into one 200. For example: 100 - 5, 7, 9/100 - Fingertip Drag. Repeating heavier distances will be beneficial. Different distances and different numbers of reps allow for different intensities. The goal for all of these, like the goal in the 3 x 500 set, is for there to be very little fade between each swim. You want to be swimming hard enough to feel it, pushing it, but not so hard that things are going wrong. Smooth Variation: Odd/Even - Easy/Hard swim. On the odd numbered laps, swim easy. On the even numbered laps, swim hard. So you are repeating 300s, but only swimming half of it hard. Mentally, this makes the set much easier. Hard laps need to be done with a strong intensity. A variation on this variation is to alternate by 50s rather than 25s, so Easy 50/Hard 50. Giant ladders are great. You need to be looking forward to that 500 at the end, so you need to pace the "easier" 100 and 200 so you still have energy for the 500, but you don't want to dog the early swim either. Nothing makes it harder to swim hard than to start out too easy. You get lazy and complacent. The most difficult part of the longer sets is staying within your body the whole time. It is very easy to drift and lose focus. When you drift your body begins to betray you and you lose intensity and smoothness. Stay focused. Monitor what your hands, hips, core, head, elbows and shoulders are doing. Do what you need to do to remain present. Higher-difficulty variation: Climb back down the ladder. After the 500 do a 400, 300, 200 and 100. Blast the 100. This should not be a regular set. It's a good test to do every once in a while. The key is staying within yourself and pushing the whole time. Focus on nothing but the lap count and fill your mind with positive self-talk. Don't think, "Ugh, 40 more laps!" Break it into smaller chunks and think, "That was a good 200; Let's do another one." For many triathletes the swim is that awful thing between the gun and the bike. Smooth swimming and swimming endurance are how you go from hating the swim to tolerating or even loving it. It's a chance to warm up, find your groove, and get your head right. Few things feel better than getting into T1 and seeing a ton of bikes. But in order to be sustainable you must work hard and, counter-intuitively, slow. Strokes fall to pieces when they are done too fast. Speed will come, but it takes a lot of work and even more patience. You are looking for a lower stroke count (less strokes = more energy later, remember?) in all of these sets. This will translate well into your open water swims. Long,smooth strokes. The sustainable sets are more important than the strong sets. Try and keep this simple tenant in your head when working on swimming endurance: A stroke that looks as good at the swim exit as it did at the start is a good stroke. If you can do that, then your swim will be good, and it will get fast.